I was ridiculously excited for Aliens vs Predator on the Jaguar – so excited that it represented the rare instance where I was actually prepared to buy an entire console solely on the perceived merits of one game. Unfortunately, I was a kid with no money, so the issue was moot. Fast forward to about five years later, and the news that Rebellion was making AvP for the PC. I thought I finally had the chance to get an even better version of what I missed out on in ’94. NPCs give a pretty good reaction when startled. In short, that is not the case. 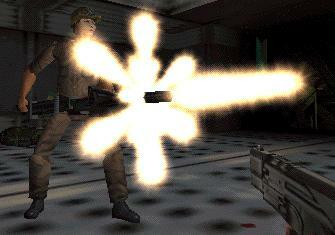 Though the developer is the same, this is not the same game as AvP for the Jaguar. Any concept of survival horror, scavenging for supplies, or stalking cautiously through an infested base, has been dropped in favor of twitch-reflex, Quake-like action. Great news for multiplayer. Not so great news for single player, or fans looking for something that replicates the tension of the films. You can play as either the Alien, Predator, or Colonial Marine in separate storylines across separate brief campaigns. You fight out of Company labs as an Alien, fight after a captured comrade as a Predator, and fight to survive as a Marine. Though each character controls roughly the same as any other FPS hero, their equipment or special abilities (as dictated by the films) turn each into an experience that is familiar enough to play easily, but distinct enough to match their skills as established on screen. The Alien game is definitely the strangest. You only have three attacks – a claw swipe on the left mouse button, a charging tail attack on the right button, and the instant-kill bite attack that is context sensitive (get close and target their head). Each species is heavily reliant on vision modes, and the Alien’s set, like its weapons, are the least complex. Your default view is a warped fisheye perspective similar to the POV effect in Alien 3. This mode highlights all enemies with a cloudy pheromone glow, visible in any lighting and from any distance. 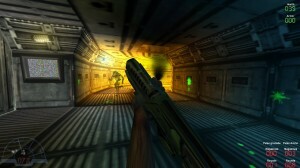 Toggling the second mode activates a monochrome nightvision view that allows you to easily navigate the dark corners and tunnels the Alien is known to populate. The Alien’s not very tough, but does gain health back by eating heads or carving up corpses (an interesting theory that might explain why Jason does what he does to unsuspecting teens). The unexpected route sometimes lets you sneak up on the AI. The Alien’s other major ability is to cling to walls. 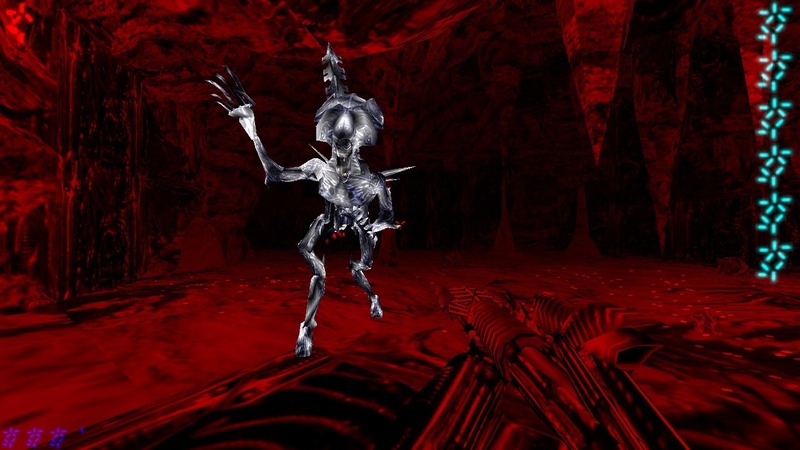 A true 3D engine finally brings with it Aliens that can crawl along the ceiling, scale walls, and generally clamber along any surface inside the level. It obviously takes some work to get used to, and has the potential to induce the same kind of vertigo or motion sickness that Descent was famous for. The Alien also operates at a ridiculous speed that can make navigating even more difficult. If you can stomach it though, you’re able to creep up and drop on enemies or jump along walls to escape gunfire. Also, while the Predator and Marine must frequently find keycards or flip switches to access new areas, the Alien’s levels are always built around crawling through ceiling vents to bypass locked doors, or locating sub-structure fuses to break to open gates. The reliance on vents and unique access tunnels means you’re definitely encouraged to keep it stealthy, but your raw speed and often one-hit-kill claws let you also get away with rushing murderously through levels like a frenzied puma. The Predator has an arsenal of hunting weapons that matches the tech from the films. Wristblades allow you to lop off limbs up close, the speargun allows you to plink them off from afar, and the shoulder cannon can be charged up to literally paint the walls with blood. At any time, you can trigger a cloaking ability that is useless against Aliens, but hides the Pred perfectly from humans (unless you get very close). Various weapons drop your cloak when fired, which can leave you vulnerable if any foes with heavy weapons are nearby. Thermal vision and three levels of zoom let you do some respectable hunting and scouting. Vision modes are authentic enough, with a thermal mode for highlighting humans, a red-tinted one for highlighting Aliens, and green mode for finding Preds in multiplayer, or lost tech within the levels. The vision modes also allow you to lock your shoulder cannon or disc boomerang onto highlighted enemies, complete with the tri-laser indicator from the films. 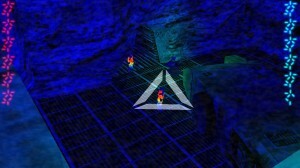 Opponents can even see the laser lock moving across the surface of walls in multiplayer, or see your cloak distort as you move. In addition to his weapons, the Predator can take a ridiculous beating. Should his natural physical heartiness get overwhelmed, he can sequester himself in a corner and use a portable medkit (itself deployed like a weapon) to restore his health to full. Naturally, his badassery makes him the easiest character in the game. His only real weakness is his reliance on energy to power his medkit, cloak, and best weapons. Uncommon powerups exist to charge this back to full, or the energy will gradually recharge on its own if not used. The trick, of course, is staying out of sight long enough for this to happen, but single player AI will readily accommodate. The Colonial Marine fields all the classic weapons from the second film. The pulse rifle works exactly as expected, and sounds simply perfect. The smartgun has a lovely fire pattern from its muzzle, and the useful ability to detect enemies and aim itself toward them. It’s great for finding Predators and engaging Aliens at long distance. The flamethrower has no lasting effect on the environment, but is perfect for torching speedy little facehuggers or ruining a Predator’s cloak. You have a few different tools for making impressive explosions, the largest of which (the rocket launcher) actually creates a polygon wall of fire that takes the shape of the hallways or rooms it roars through – very cool. The minigun from Predator rounds out the set, but I believe it appears only in multiplayer and the wave-based “skirmish” modes. AI Preds never stop moving, and so, aren’t hard to detect. Explosions still help though. 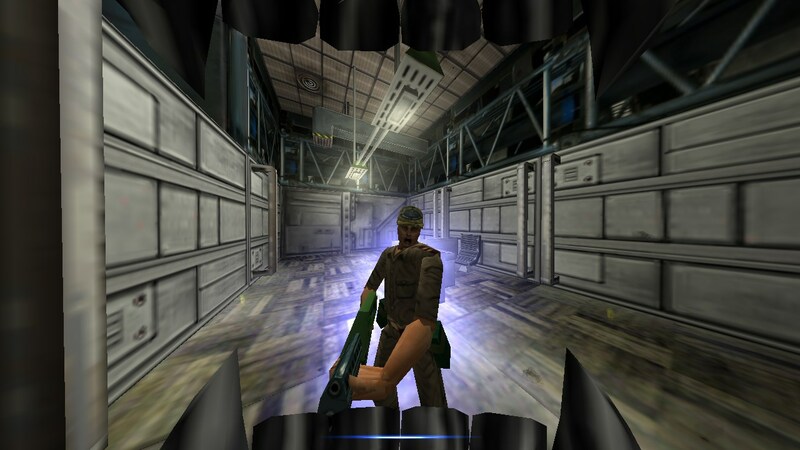 The marine also gets his motion tracker, displayed here as a part of the HUD and always active in the left corner. Like the weapons, it sounds and looks just like its filmic model. 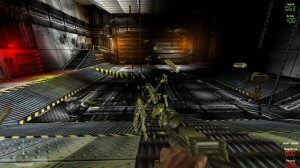 Most of the levels are in dark or poorly-lit facilities, so a nightvision mode and an infinite pack of throwable flares are available to help you navigate. You’ll spend the marine’s game taking orders from command, presented as talking-head FMV clips on monitors throughout the level, which usually involve fulfilling some Company-related goals to earn your extraction. There’s not too much to complain about graphically, and this tech is slick for the time. It’s a custom engine built by Rebellion, and handles indoor, outdoor, and complex multi-level installations (complete with a separate network of air ducts for the Alien) with ease. 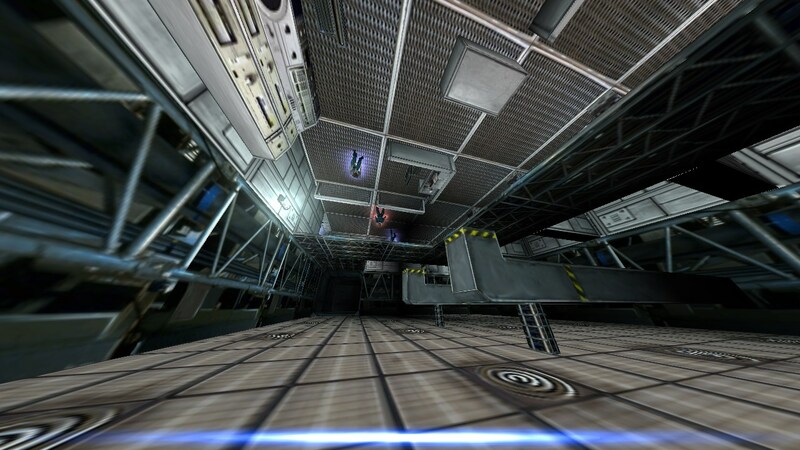 The levels are fairly simple and blocky, but functional, and their focus was obviously on the lighting. Flares and explosions alter the brightness dynamically, moody red lights and pulsing amber strobes set the tone, and flares from particularly bright lights threaten to wash out your vision just as an Alien strikes. With multiple colors, flicker settings, and the ability to destroy most lights and wash the level in darkness, the lighting here is simply perfect. Texture work is less impressive. Textures themselves look low-resolution and heavily compressed. This was before any kind of depth mapping, so complex pipe or grating textures look particularly flat and fake. There’s a nice variety of locations between levels, but quite a few repeated textures within each. The lighting helps tremendously though, and just about every area looks great in the shadowy, muted light it’s presented in – especially the hives and areas reminiscent of the Aliens colony. Pop a flare however, and the flaws become apparent. Aliens readily blow apart in chunks and flying acid. All of the characters’ abilities work without issue, and AI generally puts up a believable challenge. Marines shout and shoot frantically when trying to find a Predator. Civilians cower or flee when the monster finally reveals itself. Aliens are a slight problem as they tend to prefer the “stand upright and run right at you” approach, triggering the wall crawl only when they detect an obstruction. They’ll also get caught on geometry or confused easily – if one spawns within a room it’s like an angry bee trying to get out. You’ll occasionally get one coming at you from the ceiling, but it detracts a bit from the Marine’s game to have almost all of your supposedly stealthy adversaries stand upright and rush you. Meanwhile, AI Predators are astoundingly stupid. 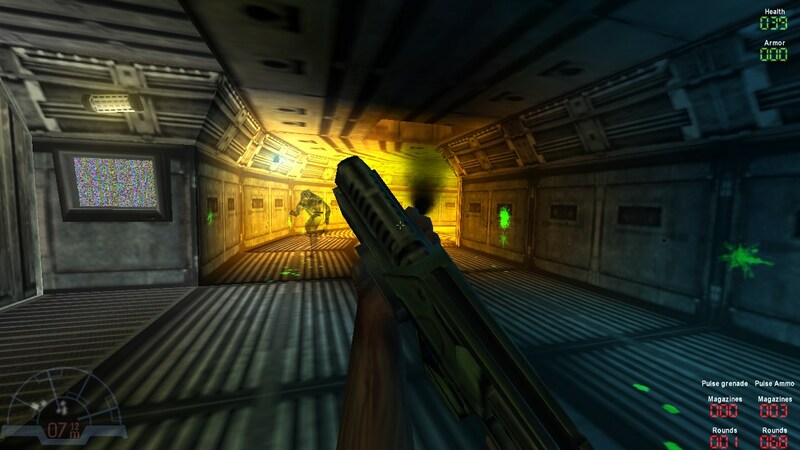 You can run right by many of them, and while they’ll occasionally fire off a deadly shot, they seem more interested in trying to navigate the level. A fourth group of foes – mechanical sentries like turrets or the game’s Surprise Plot Reveal – have precision aim and reaction times, and are a real challenge to try and cross to reach the path that allows you to get behind them. There’s some jump scares and unscripted surprises for sure, and I still haven’t nailed down the Aliens spawn system (just assume they’ll come from anywhere), but all of these shocks come from their extreme speed rather than any craftiness or stealth. And yes, Aliens and Predators will fight each other. Unfortunately, they universally prefer killing you first. 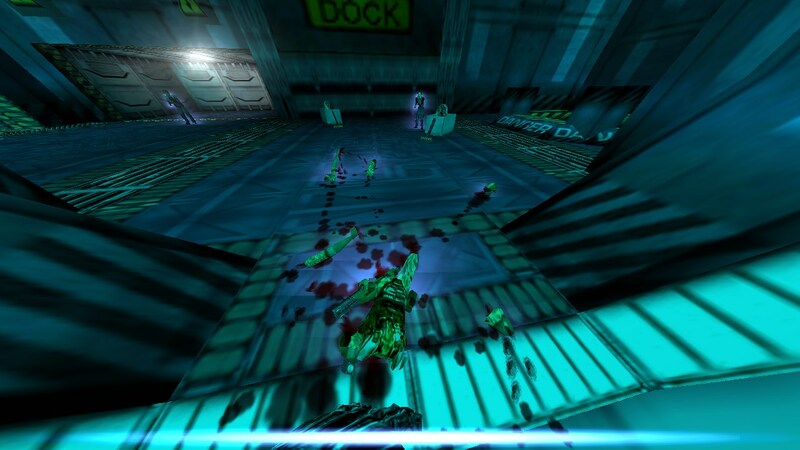 Bodies can be chopped up into component pieces. This lets the other Marines know you mean business. There aren’t a lot of polys to go around here, but all characters do look appropriate, and all can be dismembered depending on where and with what they are hit. The Predator speargun shoots off limbs and spears them to walls, while Alien claws knock off human heads and arms without even trying. Aliens are a particular highlight, as the Marine’s weapons tend to blow them apart (as in the film) complete with the sharp crack of their shattering carapace and a potentially-deadly shower of acid blood. My major complaint is how the entire game is built around speed. You’re not under constant attack as a Marine, and there absolutely are brief moments where you’re not sure from where the next Alien will come (as said, I still can’t reliably figure out what triggers a new one to appear, and that’s a good thing! ), but this is not a game about suspense. Any scares are jump scares, coming from an Alien that’s suddenly appeared next to you or landed on your head in an elevator. Fortunately, your speed can get you out of any serious trouble. Both the Marine and the Alien move at ridiculous speeds that are almost too fast for the comparatively narrow levels they’re fighting in. Rocketing through passageways as an Alien is often more disorienting than controlled, and Marines can literally outpace charging AI Aliens while running backwards. 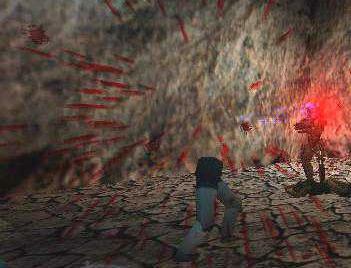 Combat between the two is frantic jousting and dodging, amplified by extra dangerous (not quite one-hit-kill, but close) weapons on both sides. It’s frantic, and while it certainly can be an adrenaline rush, there’s no down time to pull you off the razor’s edge. To me, that’s a missing part of the Aliens equation. All your hunting as a Pred has led to this – a manic circle strafe battle with the Queen. Story is also a disappointment, in that it basically doesn’t exist. Some FMV sequences throughout the levels try to give you some lazy context, but this is ultimately about running from one end of the of the gauntlet to the other. Single player is also astonishingly short, with only five levels per character. Your reward for beating these on the hardest difficulty is to play story-less missions from the other campaigns, with a hacked movement device (jetpack for Marines, grapple for Preds) to overcome levels built for the movement abilities of another species. In short, don’t come to this one if you’re expecting scripted sequences and the tension of the films. Multiplayer feels like what the game was actually built for. The speed that disappoints or frustrates in SP now shines in an arena format, and mastering the skills of each character actually gave you a unique advantage. 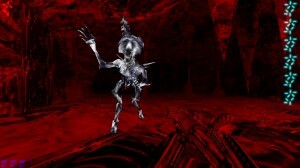 Iron up your stomach as the Alien, and you could attack a player swiftly from literally anywhere, or escape their retaliation by flying up a wall and out of sight. Learn the best uses of your weapons as a Predator, and you truly became a hunter of men; crouching in the shadows and waiting for the best moment to strike. Marines could tear the others apart in Team Deathmatch, if they used their firepower and cooperation to deny their alien foes an opening. It was certainly different, true to the characters, and much more fun than any other game’s vanilla deathmatch. Unfortunately, finding a game may be difficult today, but it’s an excellent example of asymmetric multiplayer if you can. I remember the community really wanted these pistols for some reason. Presumably to show off in deathmatch. The Gold Edition adds a requested in-mission save feature – most useful in overcoming the swift damage rates of the hardest difficulty. Death will no longer force you to the beginning of the level. It also brings a sizeable pack of the best set of levels for deathmatch, with most based off of recognizable areas from the various films. The Marine gets a BFG-a-like and a worthless set of pistols – added to shut the community up – plus replaced FMV messages delivered by members of Rebellion’s staff playing dress-up. They painfully are not actors, and shout in awkward whispers as if trying not to wake the neighbors. There’s nothing particularly wrong here – the tech works, the spirit of the three characters is captured well, and the lighting is terrific – it’s just that the design fails to capture the building dread that made the films so interesting. Every character and level plays like a deathmatch map, immersed in the period sensibilities that impossible movement speed equated awesome action. If you don’t mind running at highway speeds through low-res approximations of areas inspired by the films, this will certainly work your adrenal glands. If you’re looking for something more focused on detail and with an actual story, you’re going to want to skip ahead to AvP2. Great lighting, custom engine works well. The three characters are captured perfectly, and make for very unique deathmatch. Virtually no plot. Areas lack detail and only vaguely invoke the tech of Aliens. No saves without the Gold Edition. 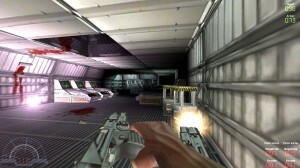 Straightforward AI, no maps, and gameplay like a typical FPS shooting gallery make for weak single-player.